Picking the right work laptop for your business is nerve-racking. Beyond your own personal disappointment, making the wrong choice also means saddling all your employees with a bad computer. It's imperative that you go with a machine that offers a great display, computing power and battery life without breaking the bank. There are only few laptops that can do this, and Lenovo's new ThinkPad W540 workstation narrowly meets most of these requirement. 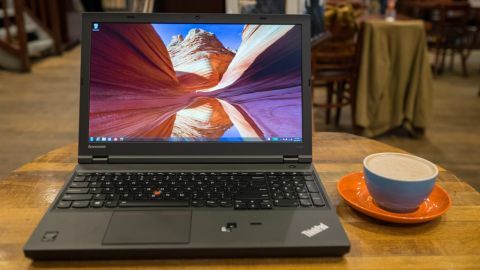 Packing a 15.6-inch, 2880 x 1620 (3K) resolution IPS display, the W540 is a mobile visual studio built on Lenovo's platform of ThinkPad workstations. Add in a high-end 2.7GHz Intel Core i7-4800MQ processor with a NVIDIA Quadro K2100M graphics card, and this machine is ready to tackle anything from simple word documents, to thousand page spreadsheets and heavy 3D modeling. However, at $2,573 (about £1,606, AU$2,946), you've got to ask yourself if power is worth the price. There isn't anything noteworthy about the W540's design. The laptop is a carbon copy of previous ThinkPad notebooks. It folds up into a plain, gray rectangle devoid of flashy accents, and featuring only a few curved edges. What the W540 lacks in style, it makes up for with a carbon-fiber reinforced plastic body wrapped around a magnesium rollcage. With these rugged elements combined, you can expect this laptop to survive falls and other accidents that would otherwise damage other notebooks. Despite these toughened materials, the ThinkPad W540 still has a few soft spots. The rightmost side of the palmrest creeks under the weight of your hand. Prodding the notebook frame along the display hinge also causes a noticeable amount of flexing. These are both small imperfections that you won't notice unless you look for them. But it's still disappointing that such a toughly built laptop bends under pressure. Another thing you won't like is the painted screen lid. Featuring a soft touch material that picks up dust and scratches easily, your new workstation won't glisten and shine after a few months of usage. Meanwhile, the interior is finished with a coarse, hard plastic texture. Personally I thought it would have made much more sense to swap these, but the lid is made of a different glass-fiber reinforced material, which could explain why Lenovo uses a soft touch coat.